Nature’s Sunshine Herbal Punch is a refreshing substitute for beverages full of sugar. The formula tastes like tropical, fruity punch and offers cool refreshment on a hot day. Honey replaces sugar in this punch, and in place of questionable ingredients, Herbal Punch includes ingredients full of nutrients such as natural herbal extracts, lemon juice, gum acacia, ascorbic acid, and rose hips, along with important vitamins. One part punch should be mixed with pure water, carbonated water, or milk. When frozen, it makes a tasty sherbet, ice pop, or shaved ice snack. 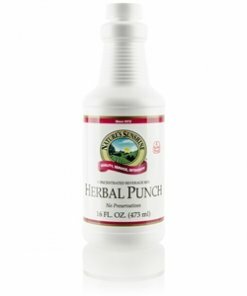 Instructions: Add 1 ounce of Herbal Punch concentrate to 7 ounces of water and serve chilled. Natural honey, water, natural herbal extracts, ascorbic acid, niacinamide, vitamin A (contains fish gelatin), rose hips (Rosa canina), riboflavin, pyridoxine,cyanocobalamin and thamine.